Justin Bieber and Hailey Baldwin went informal for the business meeting at Costa Mesa. On Tuesday, singer Justin Bieber and his wife Hailey Baldwin kept it casual for the business meeting together in Costa Mesa, California. 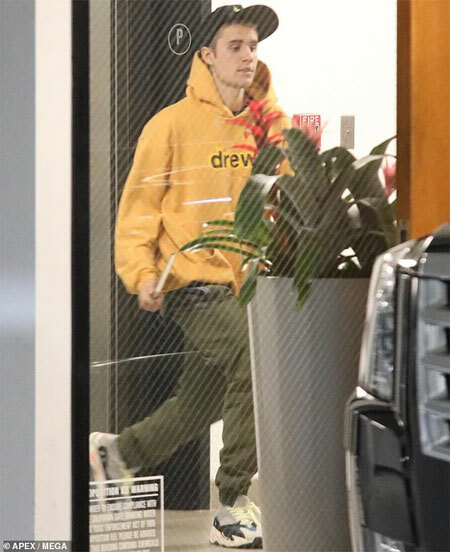 The 24-year-old singer paired a yellow hoodie with green sweatpants and sneakers while wife Hailey was seen in a racing-themed bomber jacket and black combat boots for their meeting at PBS SoCal in Orange County. While the singer accessorized with a black cap and appeared to be carrying a notebook as he left, the 22-year-old model opted for natural look flaunting her perfectly flawless complexion without makeup. She had her hair pulled into a ponytail. Further, the newlywed chose to stick with minimal accessories which included sunglasses and a gigantic wedding ring from her husband Justin. Bieber and Hailey have known each other since 2009. These long term friends were romantically linked back in 2016. In 2018, after dating for about a month they got engaged in July at the Bahamas. Around September of the last year they reportedly exchanged their vows, however, they are yet to be officially married. Prior to tying the knot with Haley, Bieber dated Sofia Richie and Selena Gomez.